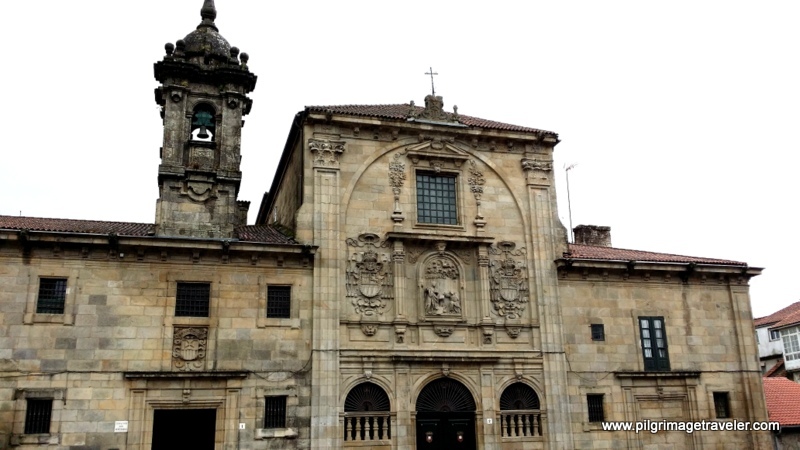 Come take a walking tour of Santiago de Compostela, with me, following the Route of Routes by John Walker. The day of my walkabout was drenched with rain, as you will see, but what were my choices? 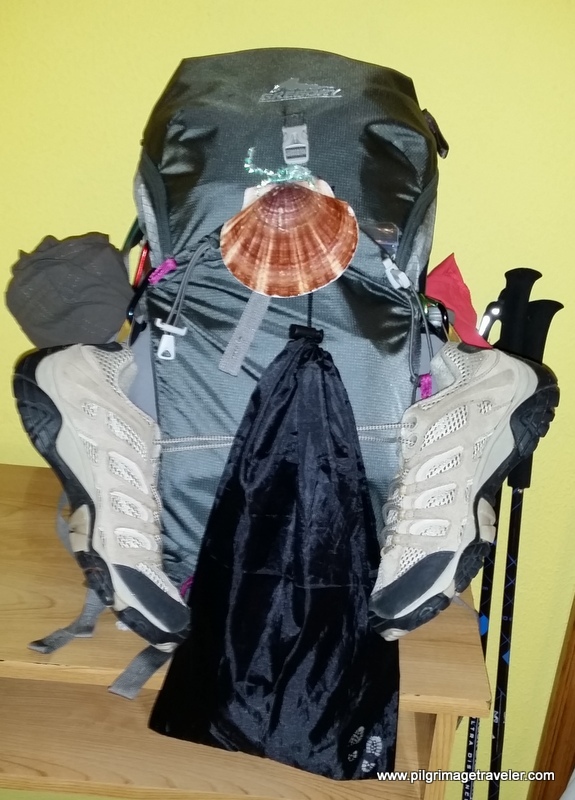 My Camino partner was ill with a gastrointestinal bug. It was the second full day of her illness. I did not know what I should do. 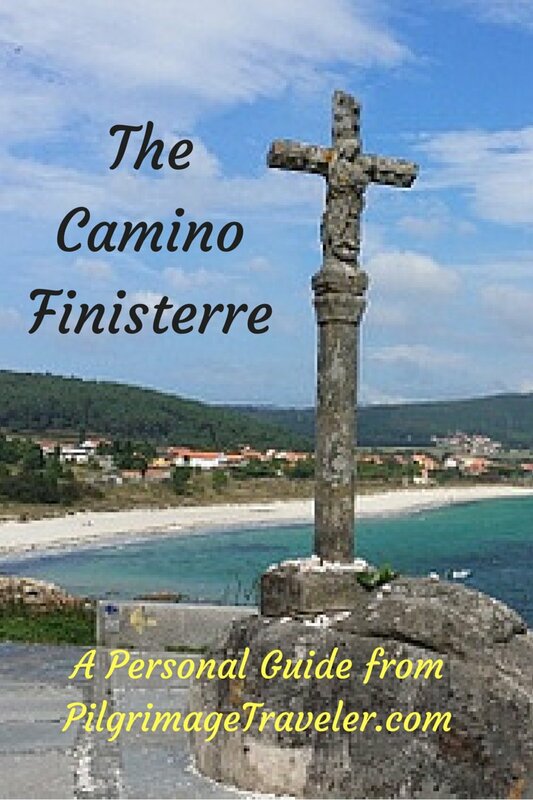 Should I go on walking to Finisterre by myself according to our original plan? Or should I wait it out another day to see if she were better? When I looked out of the window at the Hospedería San Martín Pinario where I was staying, I saw this image on the right and below! 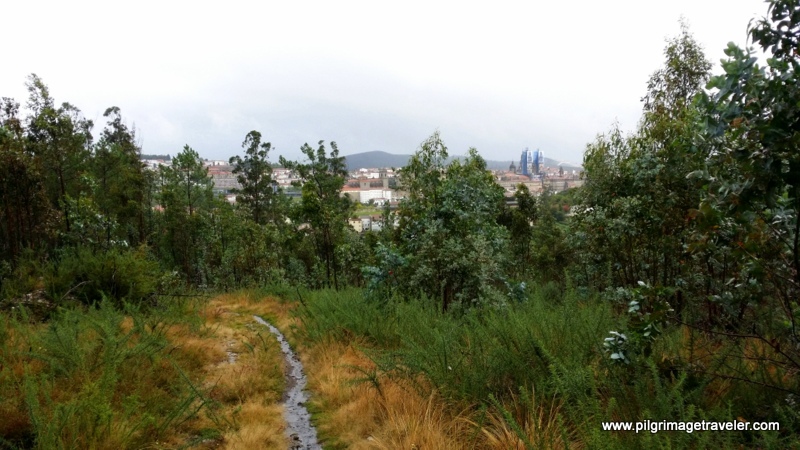 It was no day to walk a Camino. The weather had made my choice for me. 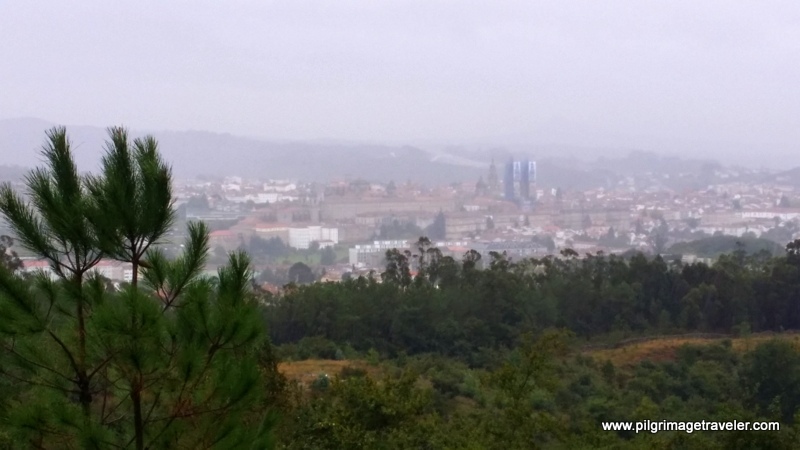 The weather was crying for me, over another day on the Camino, supposedly lost. 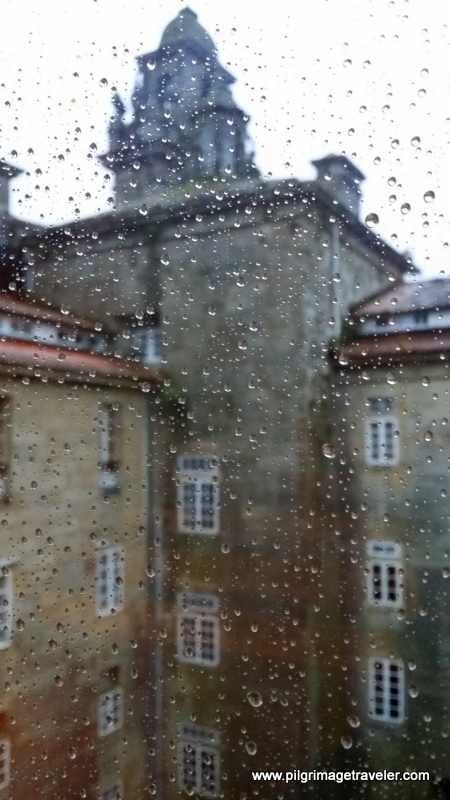 But I was determined to dance in the rain, so I decided to do the Route of Routes, a walking tour of Santiago de Compostela, by John Walker. 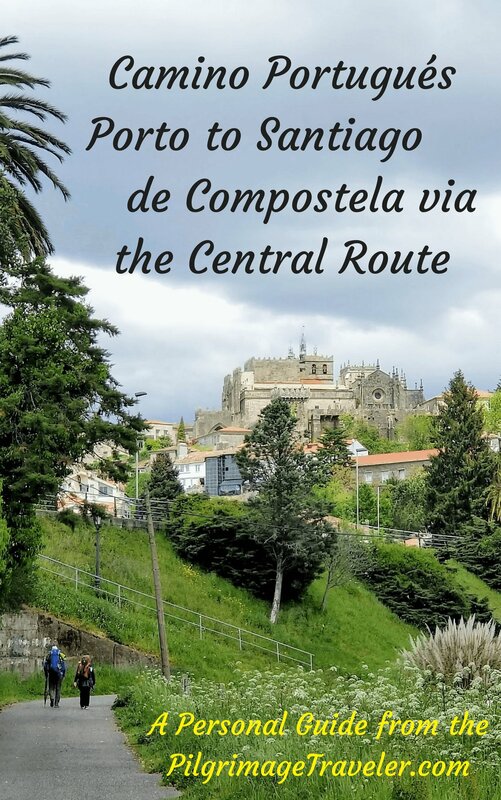 The route is essentially a compilation of the final steps of various Caminos de Santiago as they enter the city, with stops at major historical sites and a climb to the top of the mountain outside of town, called the Monte Pedroso. You can download the guide to the Route of Routes in a PDF file, by clicking here. The link will take you to the PDF file. This is a guide from the Confraternity of St. James. Please consider a donation to the organization for the use of this guide! I did not do the entire route on my walking tour, but instead chose some key places that interested me. I felt that if I did the Route of Routes I could egress into a café or building and sit it out if it rained too hard. With my plan for my walking tour intact, I headed out of the Hospedería San Martín Pinario, an historical seminary and former monestary of the Benedictine Monks, now a glorious hotel. 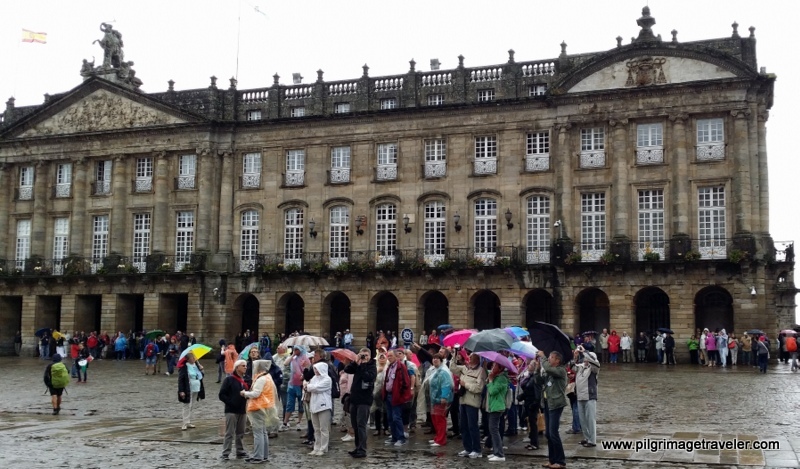 The Obradoiro Square was busy despite the rain. Many tourist groups and pilgrims were huddled under umbrellas on the square. I headed south from the cathedral on the Rúa do Vilar. My destination was the Rúa da Fonte de Santo Antonio that circumnavigates the city on the south. (This same road changes its name frequently as it circles the city). My first stop was the last surviving original gate of the medieval city wall, called the Mazarelos Arch. This historic gate is not actually on the Route of Routes, but I had read about it and wanted to see it. Something about medieval walls, gates and fortifications that strike me, I suppose. Here is the narrow gate, pictured below. As you can see nothing much of the wall remains. What is left of the gate is sandwiched between two buidlings. This gate leads to the Mazarelos Plaza. I had difficulty finding this arch, and you have to look closely up and to your left as you stroll down the Rúa da Fonte de Santo Antonio. Immediately across from the Mazarelos Arch on my walking tour, is this interesting convent, below. There are so many old buildings in this old town sector and strolling about was fascinating to me. I took a close-up of the stone carvings on the building. Unfortunately I have no information as to their meaning. Coats of arms on each side, and what appears to be a schooling scene, with an instructor, a book and a student. If you know something about this building, please leave a comment below! I continued along this street that becomes the Rúa da Ensinanza as it passes the convent, then again the name changes to the Rúa da Virxe da Cerca. 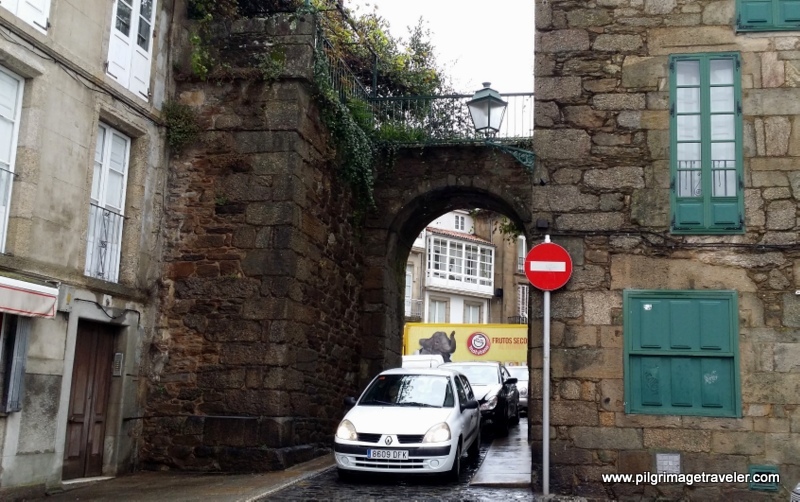 Here my walking tour joined the Route of Routes at the famous Praza Porto do Camiño where the "French Gate" (Porta Francigena) enters the city. It is a symbolic gate only, as the original is long gone! I stood here on this corner for awhile, as it was my first glimpse of the French Way, and the pilgrims were streaming in! It was fun to watch them. 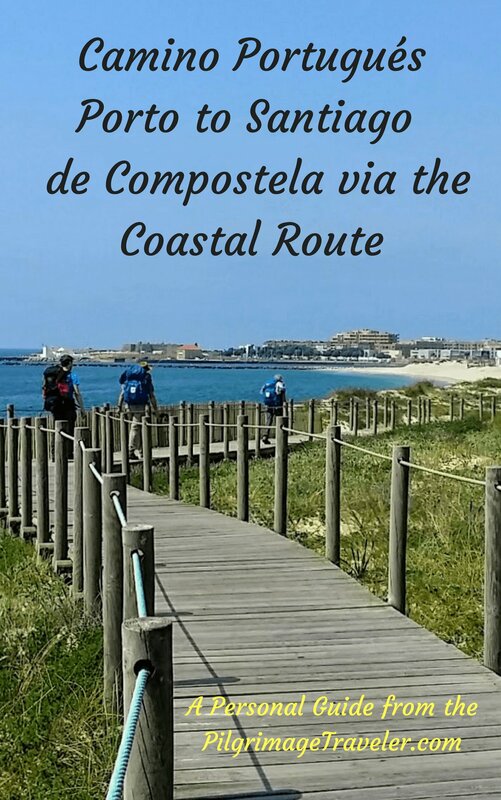 I turned right here and followed the Route of Routes onward on my walkabout, to the street called the Costa de San Domingos. 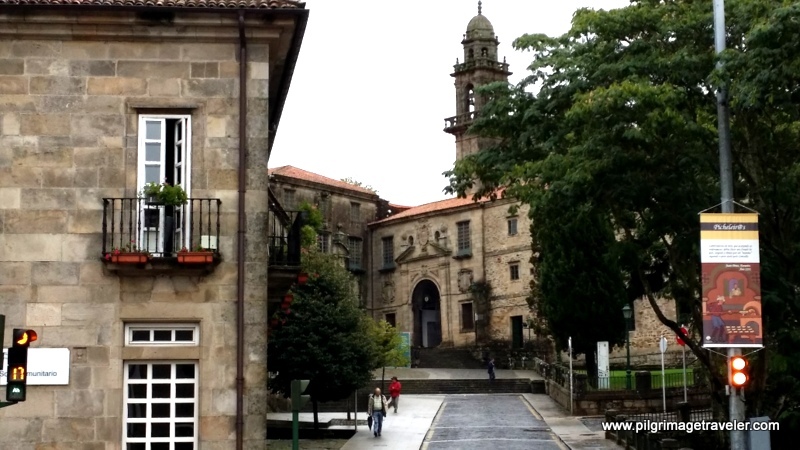 As I took the pedestrian street, on the right I immediately saw the two museums, the Galician Center of Contemporary Art and the Museo do Pobo Galego, pictured below. 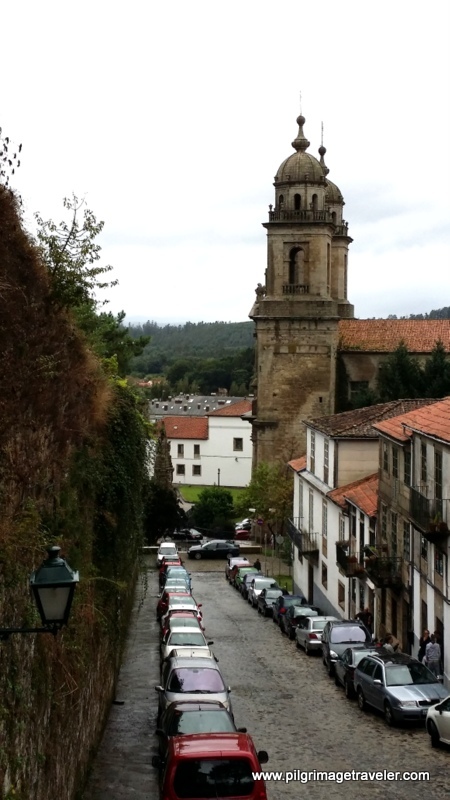 They are the Galician museums to see, but I was much too antsy to stop in, so I continued my walking tour. After passing the contemporary art museum, I once again left the Route of Routes. 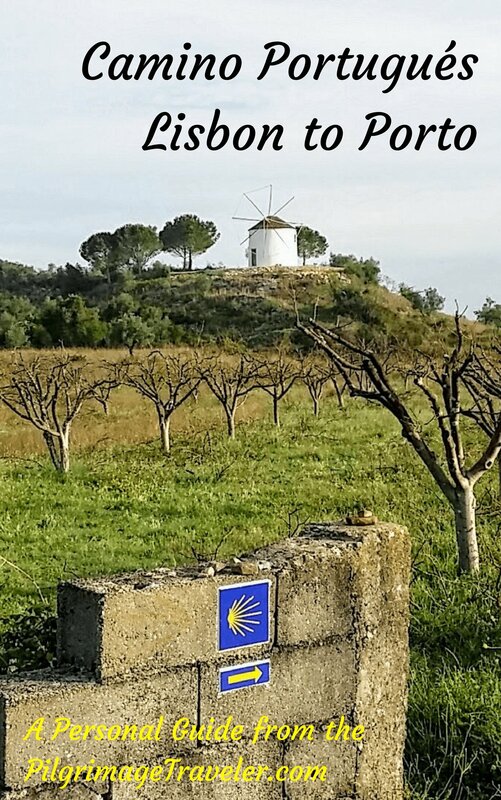 It heads north and then circles back on the final steps of the Camino Inglés, and since that was how I came into the city I saw no reason to do it again. 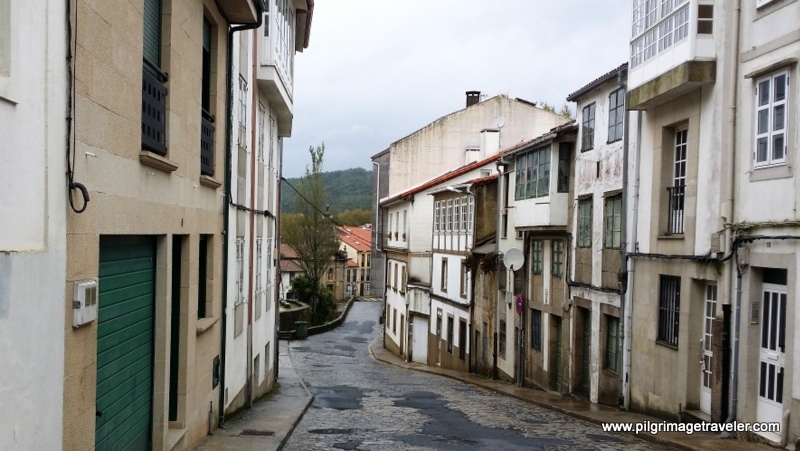 Instead, on my Santiago de Compostela walking tour, I stayed on the circular road, now called the Rúa das Rodas, as it circles the old town on the north. I rejoined the Route of Routes where the Rúa dos Loureiros joins the Rodas, turned slightly left to go straight down the Costa Vella stairs. Below is the view of the Convento San Francisco from the top of the stairs, and its prominent steeples. I was lucky as the San Francisco Church was giving an additional Compostela in 2014 to commemorate their centennial year, which I obtained. 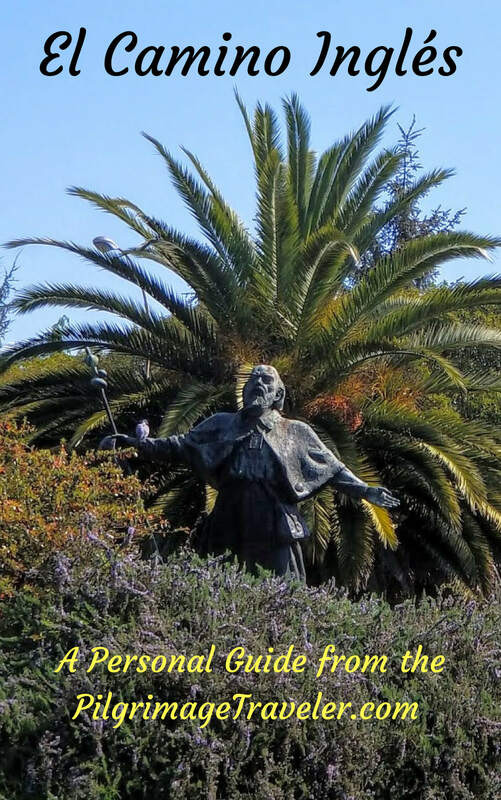 Below is a photo of a sculpture of San Francisco that is quite prominent in front of the church complex. Incidentally, this photo was taken on another day, when it was sunny, not the day of my rainy walking tour! 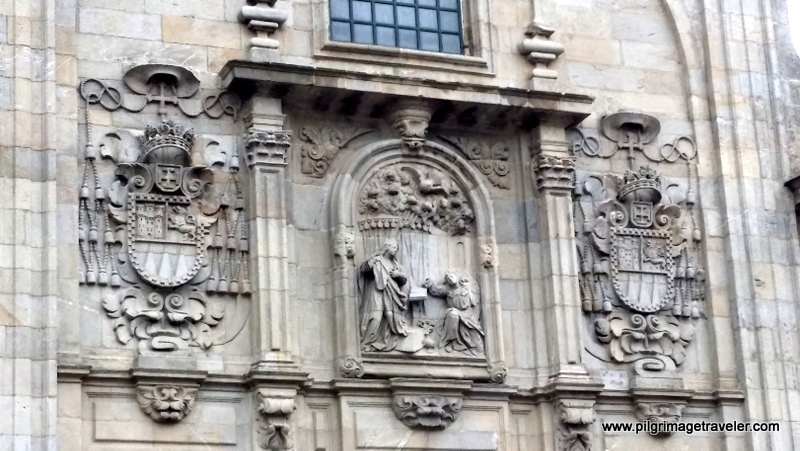 I walked past the sculpture and the San Francisco Church along the Costa de San Francisco, continuing to walk the circular route around the old town. Turning left onto the Rúa de Carretas, I shortly came to the Parish Church of San Frutuoso. It is easy to spot because there is a police station right next to it. 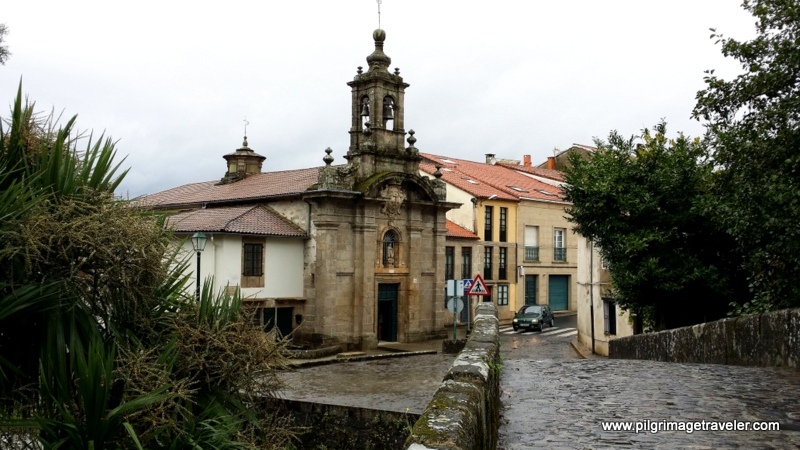 See my Day One on the Camino Finisterre for more photos of this church. At the Iglesia de San Frutuoso, I turned right on the Rúa Hortas. 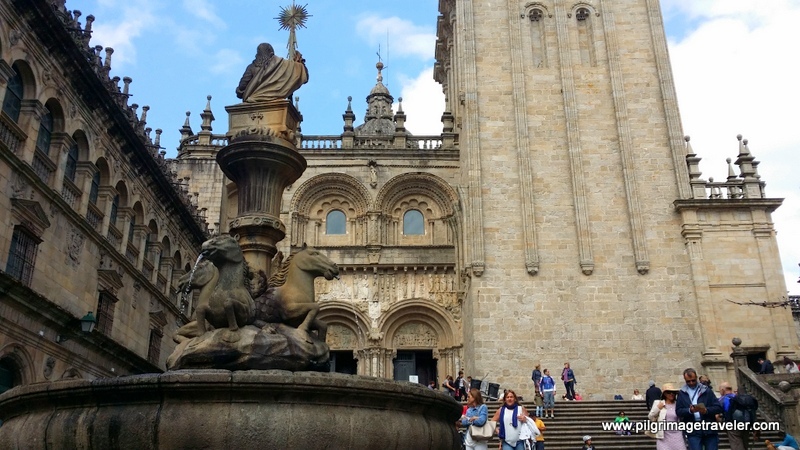 If one were to turn left instead, on the Costa do Cristo, one walks back to the western end of the Obradoiro Square, where I had started my walkabout! 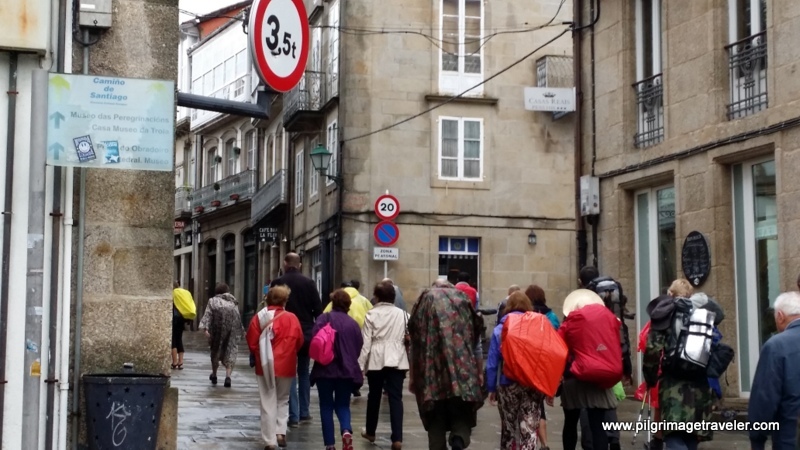 From Obradoiro Square, and down the Rúa Hortas are the first steps on the Camino Finisterre, which I was scheduled to take, but could not because of my friends illness. It was gratifying for me, to locate the start and follow it on today's walking tour, if only for a few steps. 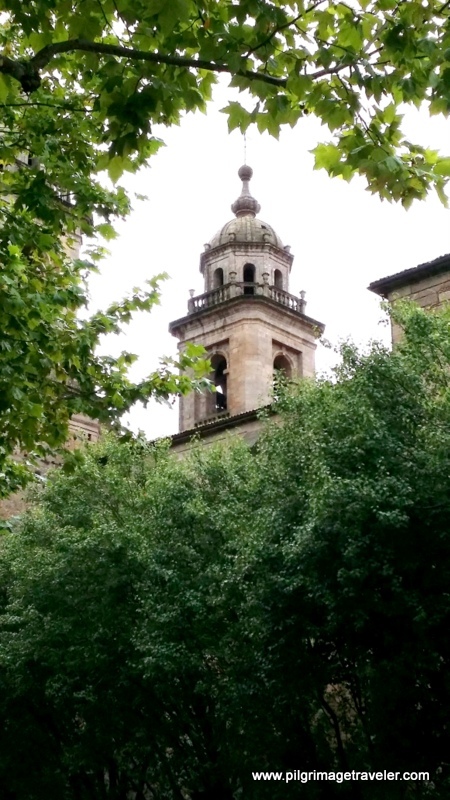 As I walked down the Rúa Hortas, I looked back up the hill to the Cathedral of Santiago and snapped this photo, below. Continuing my walking tour, the Rúa das Hortas takes a turn to the right and comes to the Rúa do Pombal. The Route of Routes leaves the Camino Finisterre here and crosses the Rúa do Pombal. I found the concrete steps across the steet, walked up them onto a pedestrian walkway that takes a very narrow way between buildings until it very quickly joins the Rúa do Carme de Abaixo. 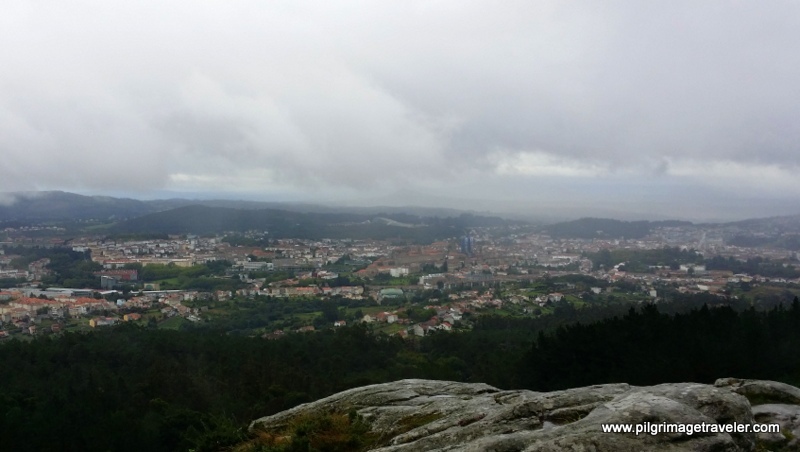 In a short while the Rúa do Carme de Abaixo widens as I show in the photo, below. My walking tour took me onward until I saw a lovely pedestrian path veer left. I stayed on the street to the right and walked over this lovely old Roman bridge. Immediately after crossing the Roman bridge, you see this lovely little chapel called the Capilla del Carmen. 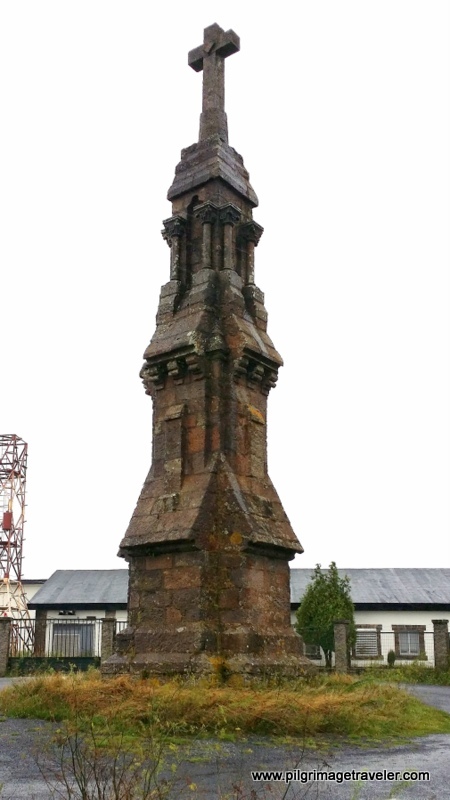 It was not open, so I continued on my walking tour, still following John Walker's guide on the Route of Routes. 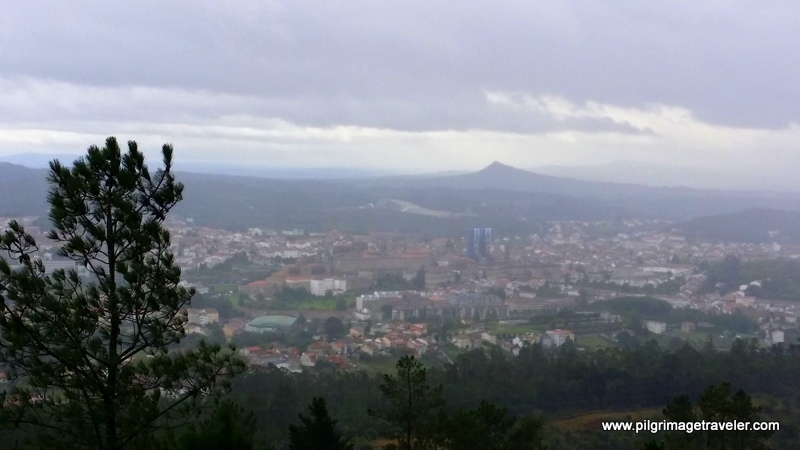 I kept straight on still walking on the Rúa do Carme de Abaixo as it climbs out of town and becomes increasingly more rural. In a short ways I came to a sharp bend with a blind corner. Immediately after this bend, I found the Rúa de San Paio do Monte, turned right and continued to follow the guide until I came to a T in a small town and turned left on the Rúa do Empedrado. 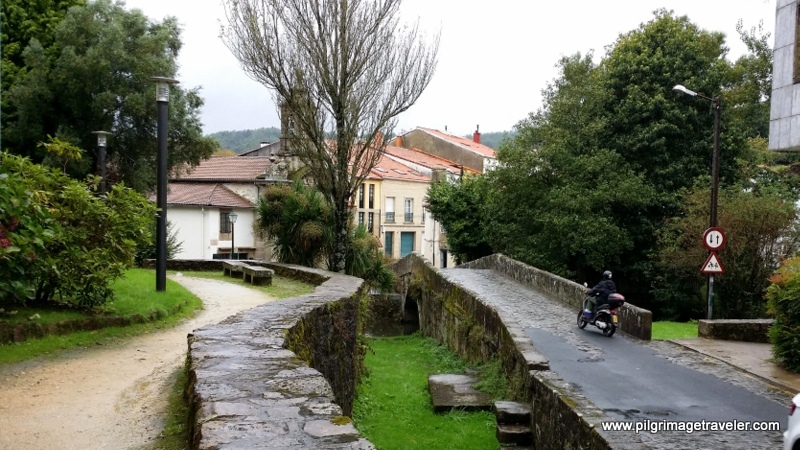 This road goes through the town and climbs by a high wall, that as you look over it, you can see emerging views of Santiago de Compostela. Very quickly this road ends and turns into a foot path. 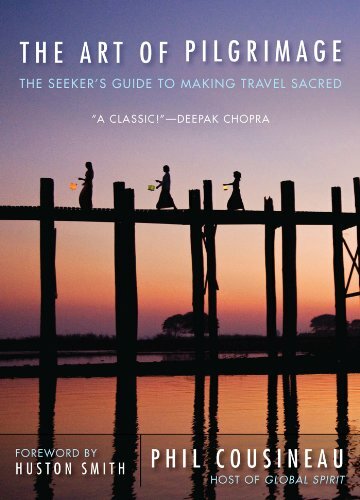 While I tried very hard to follow the guide from here, I truly doubt that I was on the one John Walker describes. I asked a young man in the town, in Spanish, if this was the way to Monte Pedroso, and he answered in English, that yes it was, but that there were many ways to reach it. Essentially, I just followed the radio towers and power lines, in the general direction of UP. 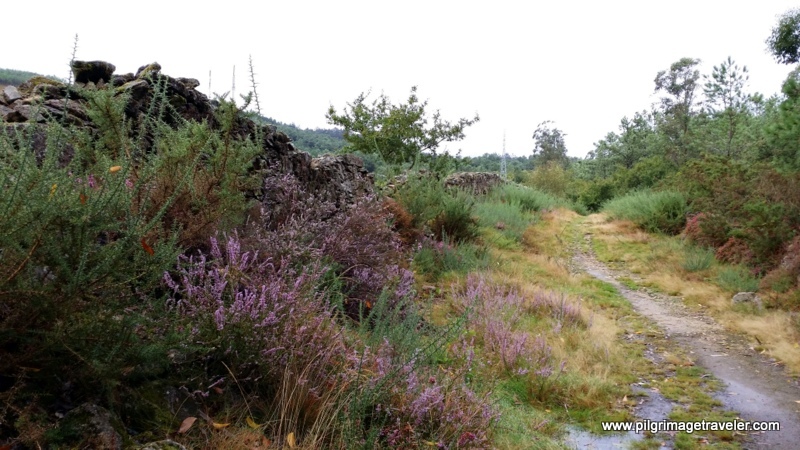 The saturated paths were lined with the most quaint stone walls that were lined with heather, as in the next photos. 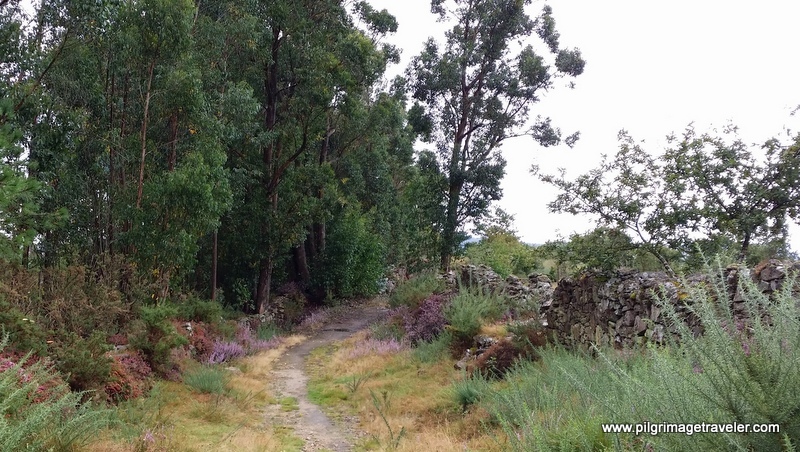 Can you tell I was enchanted by these heather-lined paths, into and out of fields and forests? It was a soothing balm to my soul and my antsyness finally abated. I was exploring and I loved it! I was lucky thus far, as it really had not rained yet, with any significance. 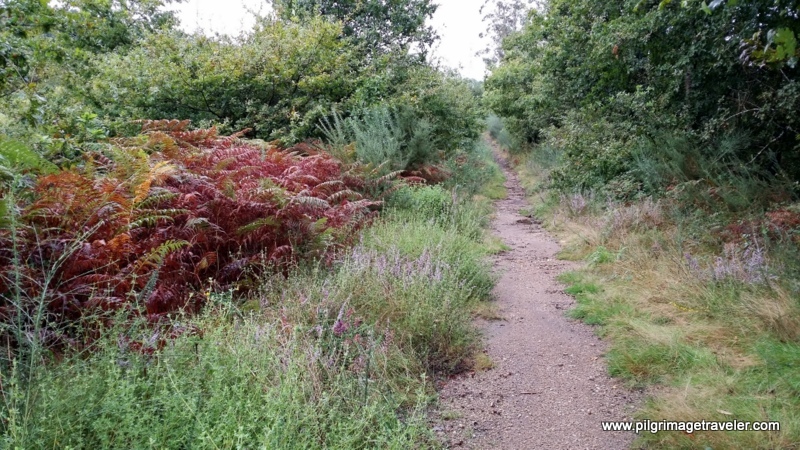 Being late September, the ferns took on a very mystical deep maroon color, that punctuated their green surroundings. I had the route all to myself, most likely because of the weather, and I felt like I had been transported to another world. I tried to be more contemplative with my photo-taking and see everything from multiple perspectives on my walking tour. It isn't easy for me to "receive" an image. I took a closer-up shot of this stone wall. I did go through a park and managed to find the small red arrows and red dots that John Walker described in the guide, so perhaps I was on the right walking tour after all! It really didn't matter to me. 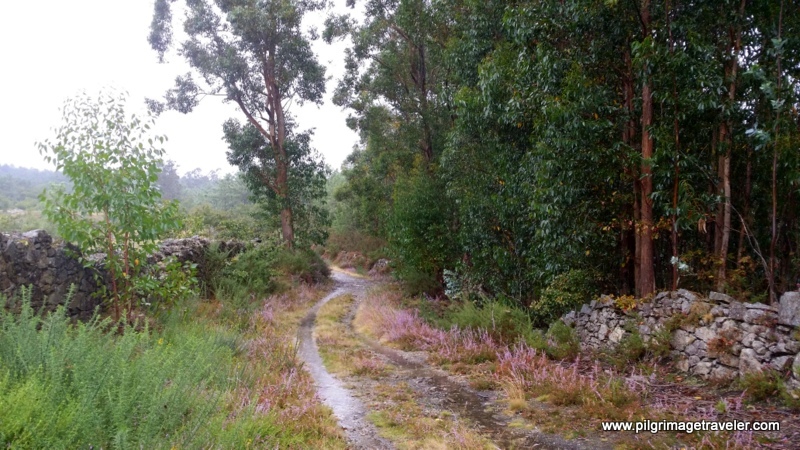 When I came across this forest path with the cruceiro, I knew I was on the right track. 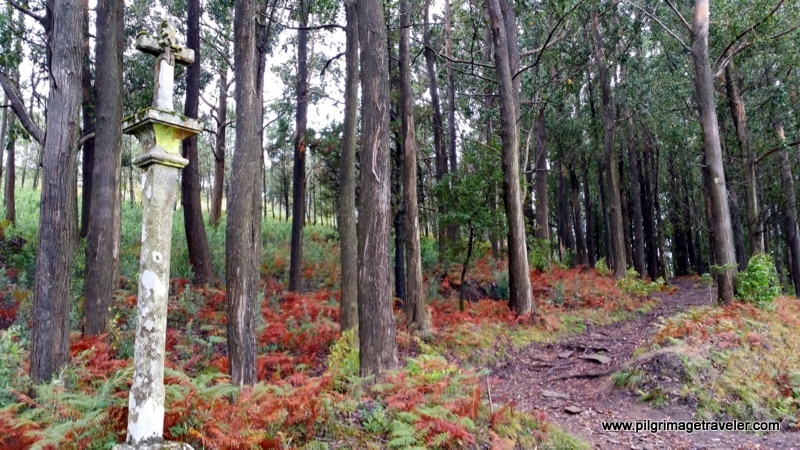 It wouldn't be long to the top of Monte Pedroso. 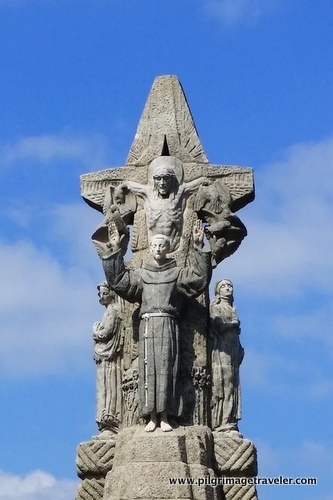 Indeed, this is the cruceiro at the top of Monte Pedroso, below. I was underwhelmed with the surroundings and the ugly buildings and radio towers. I chopped this photo off as best I could to keep a positive perspective. My mood could have been influenced by the fact that it had begun to rain heavily now ~ just as I reached the top! The timing couldn't have been worse and there was no entrance to any of the deserted buildings. I had nowhere to hide. 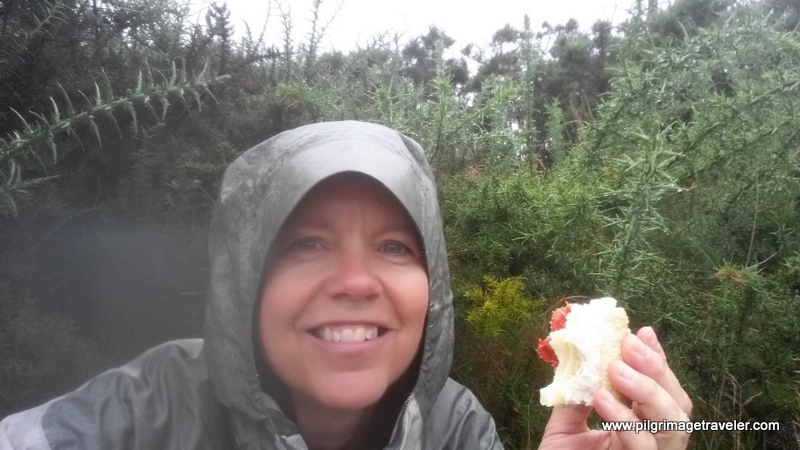 I was quite hungry by now, after my strenuous climb, so I hunkered down as best I could under some bushes and pulled out my bocadillo! It was delicious and made me feel better! Food of any type, I feel, is a pilgrim's best friend! As it continued to rain, I got up and started walking the path in the other direction, to head downward on the other side. 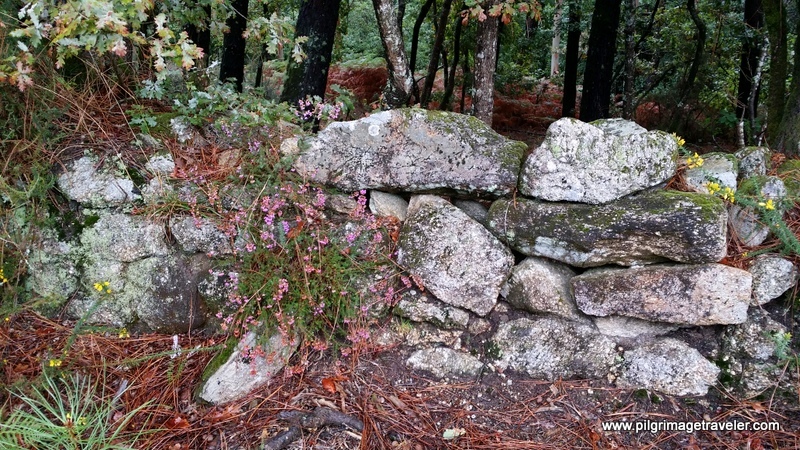 The Route of Route describes walking Monte Pedroso as a circle, and I was attempting to do this. Mostly, I just followed my nose towards the views ahead! Here is the first opening of the potential views ahead. Even in the rain, with all the clouds, I felt it was a beautiful sight. My spirits lifted once again. 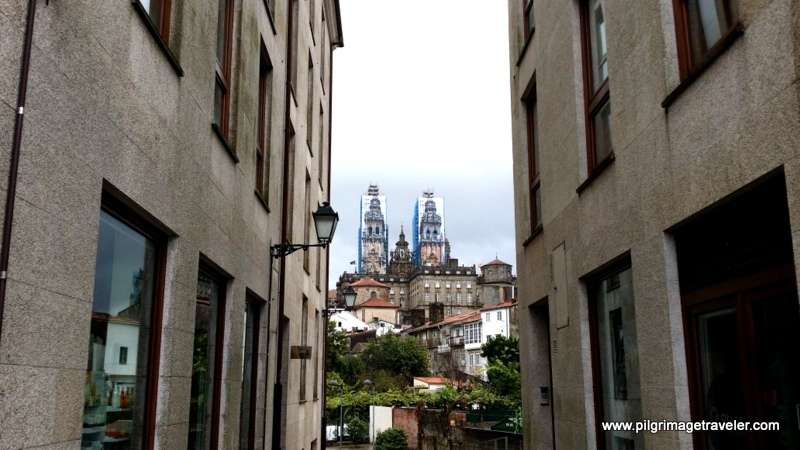 I walked out onto this rock outcropping, and the first clear view of the blue steeples of the Cathedral of Santiago de Compostela could be seen, in the photo, below. Can you spot them? Can You Spot the Blue Cathedral Steeples? Then I would pop out on the other side, and yet another view of Santiago would open up. 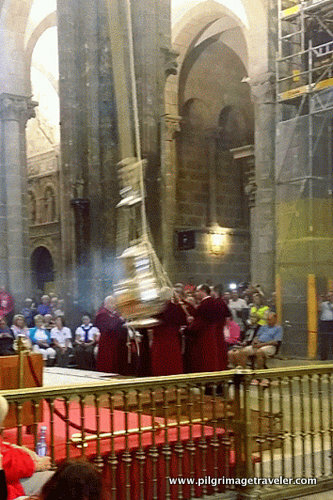 Now, the cathedral is getting closer. My final glimpse of the cathedral towers, peeking over the trees, before descending back down into the city. I hustled on as fast as I could from here to get out of the rain! 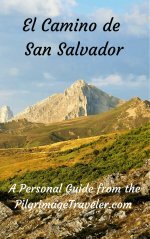 By the time I reached the Hospedería San Martín Pinario, I was drenched to the bone. 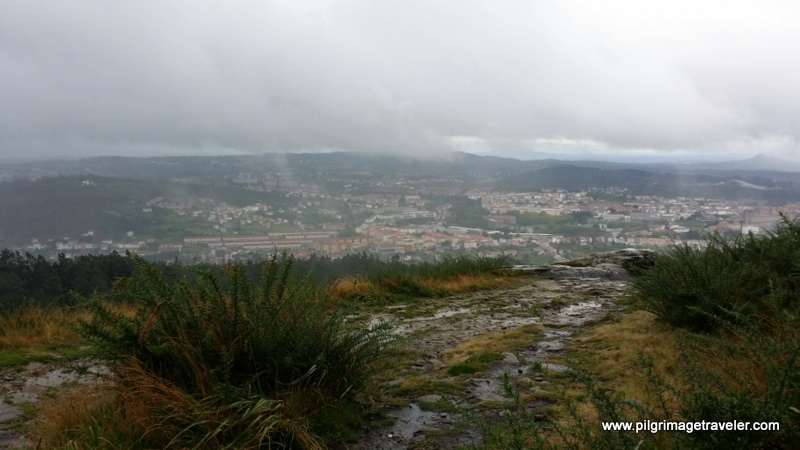 The rain was heavy since I had reached the top of Monte Pedroso, and lasted for more than an hour on my walk back down to town. I could feel the rain running into my sleeves and down my neck. I suppose that eventually, if out long enough in the heavy rain, you will get wet! 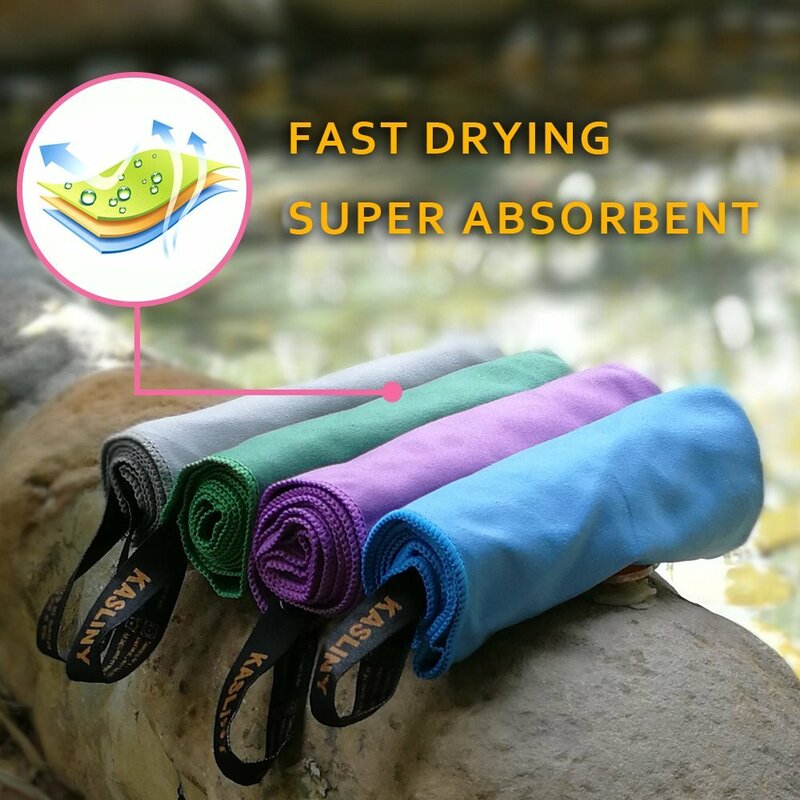 The fleece jacket under my rain jacket served as a wick for water, pulling closer and closer towards my core. In the absence of a bath tub in my room, I took the longest, hottest shower in my life! I had a very difficult time warming up, even after the shower and putting on warm, dry clothes. I did visit my Camino partner in her room and she definitely looked better. We went down to the café at the hotel and sipped a café con leche. She stated she was feeling better, finally! 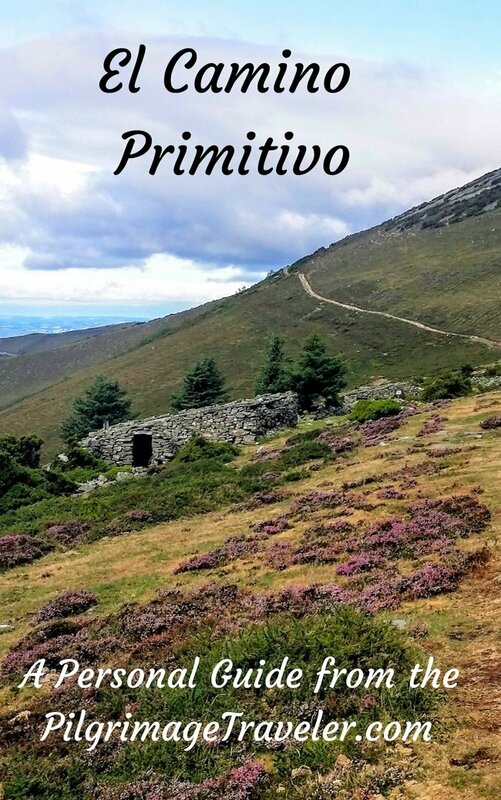 To continue my story from here, you can go to Day One, Camino Finisterre, to see what happens next! 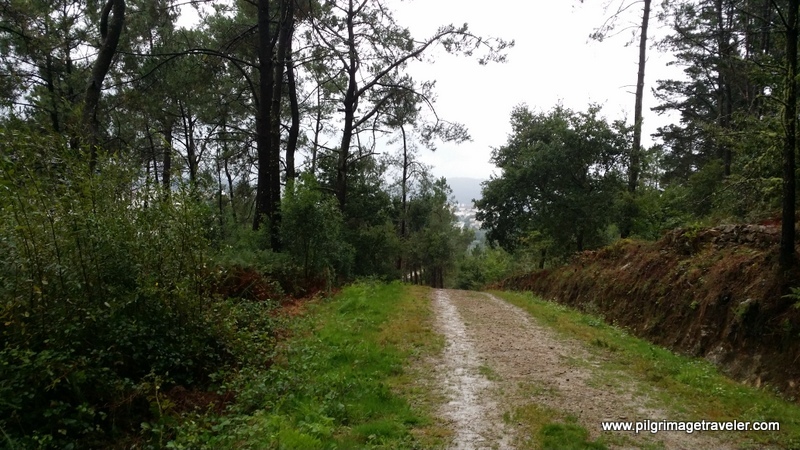 I hope you enjoyed your vicarious walking tour of the Route of Routes and Monte Pedroso! 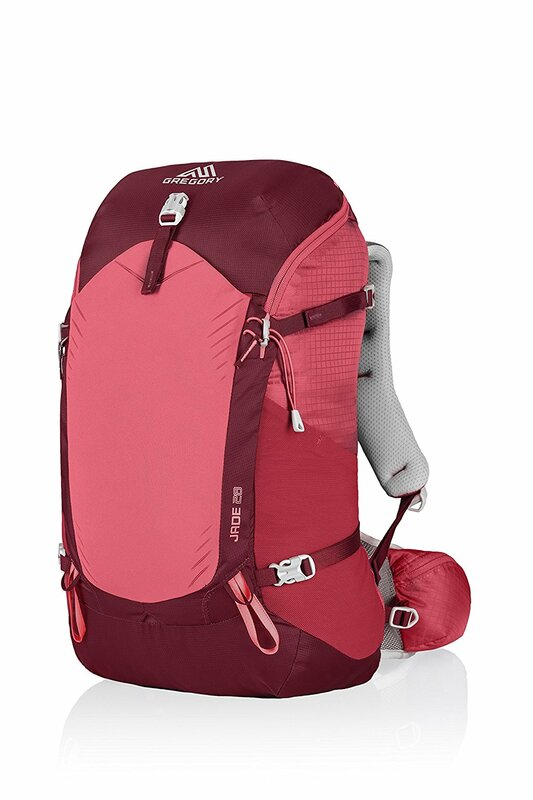 I wish that you may create your own walkabout of Santiago de Compostela. It was a most memorial day for me, where indeed, I danced in the rain! This dancer was cold and wet, but very contented, nonetheless!